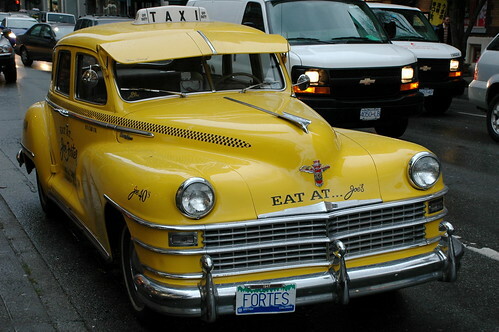 So what are we tipping taxi drivers in Vancouver these days? I think he wanted more !! but I would have been both amused at his daring – bad behavior and angry at the same!! But I don’t take taxis often so |I wouldn’t have known either.. I think in every profession people are “expecting” a 15% tip and a common expectation is rounding it up to the nearest dollar. Yours would have been 5.80$ probably rounded up to 6. Personally I wish this was not a cultral expecation, that employers would pay more in wages and that “tipping” would simply be rounding up to the dollar. I know that many waitresses for example count on getting more in tips than wages, and many of them do not account for any where near that amount on their taxes. In my mind the whole thing is another tax dodge that pressures the government into tax grabs like the HST. I would have most likely threatened him to smarten up or I would report him to his manager. Then I would have tipped him less. Tips are not an obligation or an entitlement. They are an expression of gratitude for a job well done. The minimum wage in BC is higher than many parts of North America. Granted, it’s understood that for certain professions, in certain countries, where service is important, gratuities are expected, it’s up to the customer to decide the amount of reward. I tip variably from 0% to even up to 30%, from the worst to best service. I use 15% as a base and add or subtract based upon the service level. For someone who tries to add their own tip, that is edging on a scheme, and I would tip either nothing or maybe 5% if I’m feeling generous. Even with large parties where they automatically add 15 or 20% gratuity, I’ve sometimes spoken with the manager to reduce (or increase) that amount depending upon the service level. Your trip was probably an hour of the driver’s time. If he was being paid minimum wage, your tip would total $15. an hour. So No, not quite enough.